Maulana said that the women of yesterday were very attractive ones, they used to wear beautiful Oriental headscarves with embroidery and lace. At home,when they took off their scarves, they used to have well-combed, neat, clean hair, which they tied into two braids. (Christian women used to tie one braid, so Muslim ladies should tie two, so as to distinguish themselves from the Christians.) If they wished to, Maulana said, they could separate their hair in the centre, and braid each side into one braid. Maulana described seeing his 80 year old grandmother (when he was but a boy of 5), and she used to braid her hair (even though she had so little of it left at that age), and she looked so full of light that one could not stop looking at her! Nowadays, ladies no longer have that light, since they do not follow Divine orders pertaining to their prohibitions. Women of old used to keep long hair, some even had hair reaching their heels! They used to comb their hair with heavy ivory and bone combs. Women who didn’t cut their hair, were always full of health and energy and looked far more lady-like than women who did, who were always sickly and listless, and looked like men with their short hair. We are back in the second period of ignorance today. Some women erroneously believe that having long hair makes them dense or stunted, so they cut it, hoping that it will lead to more intelligence! Women today make an open shameless display of their beauty to strangers. They are also allowing male hair stylists to touch and fondle them inappropriately. Maulana asked incredulously, “Do you get any benefit or happiness from doing this?” All it does is to bring illnesses and diseases to them. What is point of being a millionaire, or even a billionaire, asks Maulana, if you are constantly ill (because of Divine retribution for leading a defiant lifestyle)? Maulana says, many people will find a never-ending string of ailments afflicting them – one day its migraine, the next day they have backache, and the following day it’s a painful joint. How can you taste the sweetness of life, if you are constantly besieged by Divine curses? And why would you want that, when you can lead a blessed life, by respecting Heavenly rules? Maulana then prayed for forgiveness, and prayed for Allah to send the Nation a Sultan who will lead us on the way of truth (Haqq). Maulana said that we are in need of a Sultan, we cannot do without one, for a Nation without a Sultan, was like a Palace without a King. There is no one who can replace the King, no one can simply step in to fill that void. It is incredible that even animals know about the crucial need for a Sultan, whereas Man is completely oblivious to it. In a Hadees, Rasulullah (saw) said, “My curse be upon a woman who cuts her hair, even if she does so with the permission of her husband.” It is said that a woman’s femininity and beauty lies in her hair, just as a man’s masculinity lies in his beard. A beardless man is the equivalent of a bald woman – both are terribly unattractive and unnatural. According to a Hadees, Allah curses a man who looks like a women, and a woman who resembles a man. Today, so many beardless men look effeminate, while women who have short cropped hair look very man-like. (Read this past Suhbah on the real beauty of men and women). Women’s beauty/attractiveness does not come from exposing themselves, dressing indecently or behaving cheaply. It is amazing how the media and propaganda has made this the norm, that the only way to be seen as attractive, is to look half-naked, voluptuous, and slutty. Today, when a woman dresses decently or starts wearing a headscarf, it is as if, she has been ‘brainwashed’ to follow a ‘backward’ way of life. Hence, we see Muslim women ashamed to be seen with the headscarf, and on top of that they are spending money on cutting, dyeing, rebonding, perming etc their hair! It is as the Prophet (saw) predicted fifteen centuries ago, “My Nation will follow the ways of the unbelievers, even right into the hole of the snake,” which means that the latter-day Muslims will be so devoid of understanding of their religion, that they will copy the ways of the unbelievers, even to the extent of doing things that are downright nonsensical and illogical and even self-endangering. Amazingly, these so-called ‘Muslims’ who worship the lifestyle of the unbelievers, have never thought for even one moment, that while they are intent on copying everything about the lifestyle of the unbelievers, the unbelievers themselves are not in the least interested in copying anything about our Islamic lifestyles! None of the unbelievers wear headscarves, or celebrate Eid, or memorize and hum our Zikirs, or gather with us in our majalis�- they despise our lifestyles, yet we are so blind as to look up to, and to emulate, their shaitanic way of life! What is wrong with you, oh believers? We have been brainwashed to believe that our Islamic way of life is backward and old-fashioned! How can the Sunnah of the beloved Prophet, the lifestyle that brings Allah’s blessings with it, be backward? And how can a lifestyle brought by shaitan, which has Allah’s curse and wrath attached to it, be the progressive, modern, accepted and model way of life? It is puzzling, but this is the end-of-times. Oh believers, leave the lifestyle of the unbelievers! The Prophet (saw) said, “Whosoever imitates (a group), then he is from them.”� Believers must go to great lengths to distinguish themselves from unbelievers. When Rasulullah (saw) was told that the Jews were fasting on the 10th of Muharram, the Day of Ashura, to celebrate Sayyidina Musa’s victory over Fir’aun, Rasulullah (saw) said, “We have more right over Musa than the Jews,”� and he commanded the Muslims to fast on that Day too, and in order to differentiate our fast from that of the Jews, the Prophet (saw) ordered the believers to fast an extra day, either on the 9th of Muharram, or on the 11th of Muharram, so that we fast for two days, as compared to the Jews’ single day of fasting. Similarly, Maulana said that, since Christian ladies were known by the single braid they tied, Muslim ladies should tie two braids. Their ways are unclean! How can an unclean way lead to a clean destination, Paradise? When Sayyidina Adam became unclean from one sin, he was ejected from Paradise! So follow a clean, blessed way, the Ways of the guided ones (Prophets and Saints) to reach eternal happiness! But if you choose to defy, Allah is not in need of your worship or obedience. Maulana encouraged women to be housewives based on a Hadees where Rasulullah (saw) said to Sayyidina Ali (rakw) and Sayyidatina Fatimatul Zahra (ra) upon their nikah, “Ali, your place is outside (the home), and Fatimah, your place is inside,” making clear that the ideal conjugal roles, are for men to seek the livelihood, while the womenfolk are to tend to domestic affairs, looking after the home and the children. Look at what blessings from Allah, Rasul and the Saints descend on housewives in Maulana’s Suhbah above! Islam is honouring women, not degrading them, they are delicate and fragile beings with the manisfestation of Allah’s Attribute of beauty (Jamal), while men are beings manifesting Allah’s Attribute of Majesty (Jalal). Islam has always honoured women, even the Ant who called the Valley-full of ants to safety in Surah An-Naml, was a female ant! Women are gentle, loving creatures, and that motherly touch is needed in moulding children into good believers – no child-care centre or maid can replace an upbringing in the hands of the mother. It is sad that women today abandon their Divinely-ascribed roles, just to supplement the family income. In Surah Al-Ahzab (Surah Al-Ahzab 33:33), Allah said to women, “Stay quietly in your houses.”� Rasulullah (saw) said, “Women are the door of fitna’.”.�By keeping the precious jewels (women) in a sacred place, Islam wishes to preserve the integrity of the family unit and honour of women, as well as prevent adultery and fornication, by defining their roles (for which they have been equipped biologically, physically, mentally and spiritually), most beautifully. The Sun and Moon each have their own orbits, each has its own unique journey and role, each has been equipped for that specific Divine duty that it has been created for. Similarly, men and women have been created and equipped differently and uniquely for their respective duties. Just as the Sun cannot do what the Moon does or vice-versa (the Solar System would be in chaos if they tried to switch places), men and women must follow the Divine roles they have been designed for. Once they try to move outside their ordained ‘orbits’, chaos will descend upon their lives, as we are seeing right before our eyes, today. 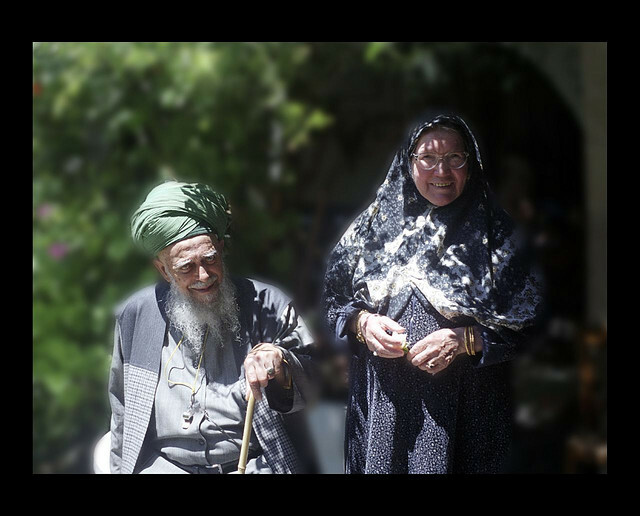 Maulana Shaykh Nazim and his late wife, Hajjah Aminah Adil. He had described his life with her as blissful, for the lives of those who live to please Allah, are made pleasing by Allah. Al-Fatihah. This 12 minute Snippet in Turkish, can be only be watched at www.Saltanat.org, choose from the menu on the right, ‘Nasihat 30.Oct 2010’. There is a CC button next to the Volume control at the bottom of the screen to choose choose subtitles in eight languages, choose from Arabic, Bahasa Indonesia/Melayu, German, English, Spanish, Italian, Russian and Turkish. During Live Suhbahs, the buttons at the top provide Live Audio Translations into other languages.�No other site carries this video. Saltanat TV is the Official Site of Maulana Shaykh Nazim that is sanctioned and approved by him personally. This entry was posted in Maulana Shaykh Nazim's Suhbahs and tagged Family, Marital Bliss, Modesty, Woman. Bookmark the permalink.